We’re definitely back on a roll now with the second recipe in two consecutive days! I’m quite surprised at myself but I guess I’ve finally managed to get myself re-organised once again and into a solid habit of cooking something new and posting it! This will definitely continue as I’m off from work in December (can’t wait!) so will have plenty of time to publish new, healthy recipes that really don’t require too much effort. Just like this one. The majority of the ingredients you’ll probably already have in stock. I had the cod fillets in the freezer and defrosted them overnight and only had to pop out for some fresh thyme sprigs and fine green beans. 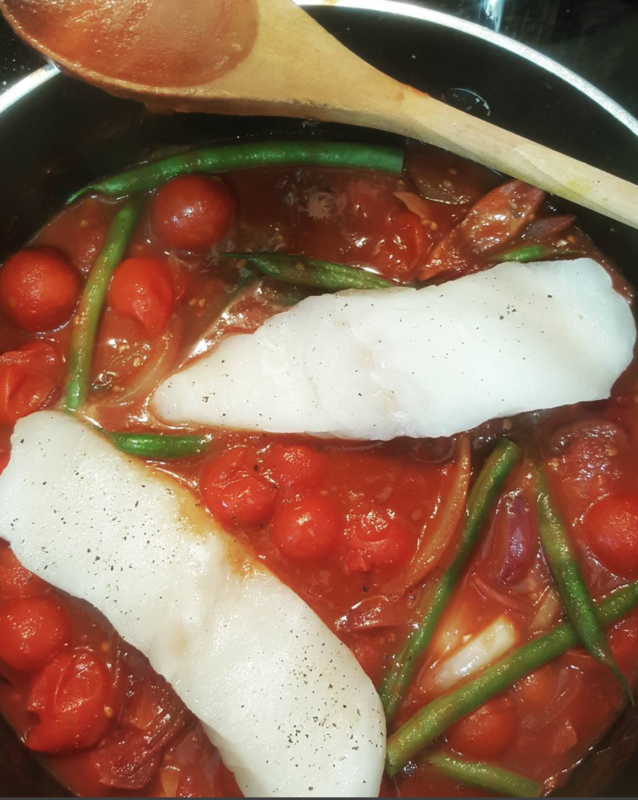 I’ve used cod fillets but really you can use any fish and just adjust the cooking time based on the size of them. Fish is very delicate when cooking so it’s important to keep checking you’re not overcooking it. Usually it doesn’t take longer than 10-15 minutes. 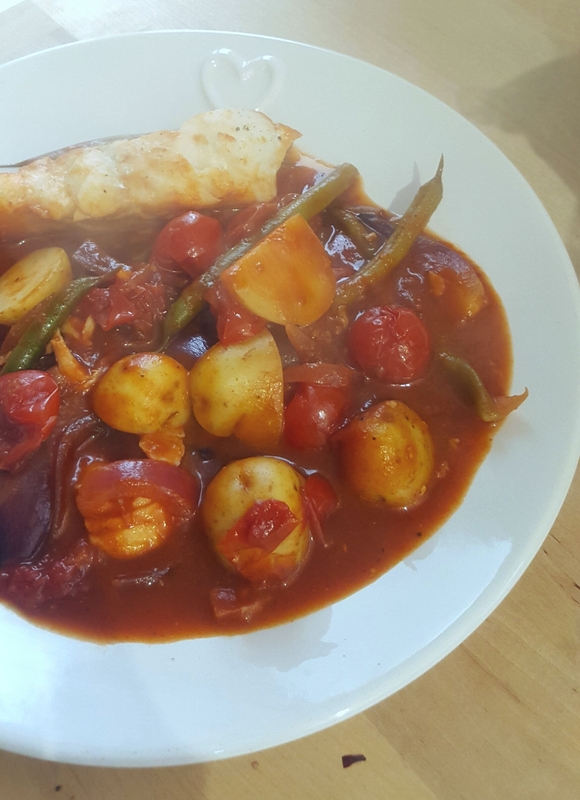 Anyway I hope you enjoy this delicious dish, the sauce is rich and is perfect for an evening dinner if you want something quick, easy and healthy. It ticks all of those boxes! Place a casserole dish on a medium heat with enough olive oil to cover the surface of the pan. After a few minutes add the red onion and stir. Once the onion has began to soften add the crushed garlic along with a good amount of seasoning. Cook for 2-3 minutes. Meanwhile in a separate saucepan, add the new potatoes along with boiling water, bring to the boil on a medium-high heat and cook for 15 minutes with the lid on. Add the can of chopped tomatoes into the casserole dish and then run the empty can under a hot tap until it's a quarter filled with water, swirl this around the can and add this also. Immediately add the tomato purée, sugar, balsamic vinegar, chilli flakes and thyme sprigs, along with some more seasoning then mix well and bring to the boil by placing the lid on the pan. Meanwhile season the cod fillets and add them to the pan along with the fine green beans. Place the lid back on and reduce the heat to low, then simmer for 10 minutes or until the cod easily flakes away. Carefully drain the new potatoes using a colander or large enough sieve, add them to the casserole dish, mix everything through and serve.